Q. 1.0 What is Input Director? Q. 1.1 Why would I want to use Input Director? Q. 1.2 How is Input Director best used? Q. 1.3 Who wrote Input Director? Q. 1.4 What is the latest version? Q. 1.5 Where can I download Input Director? Q. 1.6 How is Input Director licensed? Q. 2.0 What are the system requirements? Q. 2.1 What is a master system? Q. 2.2 What is a slave system? Q. 2.3 Is Input Director compatible with multi-monitor setups? Q. 2.4 Do I need to run the same version of Input Director on all systems? Q. 2.5 How do I choose the installation directory for Input Director? Q. 2.6 Is there is a 'silent' install mode? Q. 2.7 Can one system be both a master and a slave? Q. 2.8 Does Input Director ever "phone home" (connect to a remote server)? Q. 2.9 How do I specify how many monitors are attached to a system? Q. 2.10 Is Input Director compatible with computer games? Q. 2.11 Do I need to disconnect the keyboard/mouse from a slave system? Q. 2.12 What is the Information Window "Make input pass-thru this window" option? Q. 2.13 Is Input Director compatible with VPN Clients? Q. 2.14 Does Input Director support IPv6? Q. 2.15 My anti-virus product has flagged Input Director as a virus / trojan / keylogger? Q. 3.4 Why does the cursor return to the master with 'slave unresponsive' messages? Q. 3.7 The cursor isn't jumping to the correct system/monitor? Q. 3.8 Why is the cursor still moving on the master even though I'm controlling a slave? Q. 3.9 Master Configuration issue - When I add a slave, Input Director informs me that the slave is this system and I need to add a different computer? Q. 3.11 I can't resize/reposition/right-click on the Information Window? Q. 3.12 My hotkey isn't working? Q. 3.14 Input Director keeps informing me there are older/newer versions of Input Director trying to connect? Q. 4.0 How can I control a slave before I have logged into it? Q. 4.1 How do I return the cursor to the Master system? Q. 4.2 How can I quickly clear the 'skip' status of a slave? Q. 4.3 How do I determine a computer's (host) name under Windows? Q. 4.4 How do I setup my 3rd-party software firewall to allow Input Director Masters and Slaves communicate? Q. 4.5 How do I secure Input Director? Q. 4.6 How do I set up Input Director so that I can use any keyboard/mouse to control any system? Q. 4.7 How do I get rid of the "Water Ripple" effect? Q. 4.8 How do I stop my cursor from accidently slipping to another system? Q. 4.9 How do I turn on Mirror Input Mode? Q. 5.0 When I add a slave, I get a "Hostname doesn't exist error"
Q. 5.1 What does a green tick next to a slave's name mean? Q. 5.2 Why am I getting a red cross next to a slave's name? Q. 5.3 What is slave skipping? Q. 6.0 How should I decide how to limit which master systems can control a slave system? Q. 6.1 When I add a master system, I get a "Hostname doesn't exist error"
Q. 7.0 What type of data can be copy/pasted using the shared clipboard? Q. 7.1 Why do I see an "Unable to paste" message pop-up when I am not pasting? Q. 7.4 How do I do file copy/pastes? Q. 7.5 What is the purpose of the exclude C$, D$ shares option on the preferences page? Q. 8.0 How do I switch on encryption? Q. 8.1 What information is encrypted? Q. 8.2 Which cipher does Input Director use? Q. 8.3 Which encryption library does Input Director use? Q. 8.4 Why is the message "The system xxxx does not have data security and is retrieving remote clipboard data insecurely" being displayed on a slave when I paste clipboard data? Q. 9.0 What is the intent of Input Director macros? Q. 9.1 How do I record a macro? Q. 9.2 What are the different Macro targets? Q. 9.3 How do I play a Macro? Q. 9.4 Can I record mouse movements/clicks? Q. 9.5 I clicked the "Stop Recording" button and the Edit Macro window didn't pop up? Q. 9.6 I tried to record a macro but none/not all of my keystrokes were captured? A. 1.0 What is Input Director? 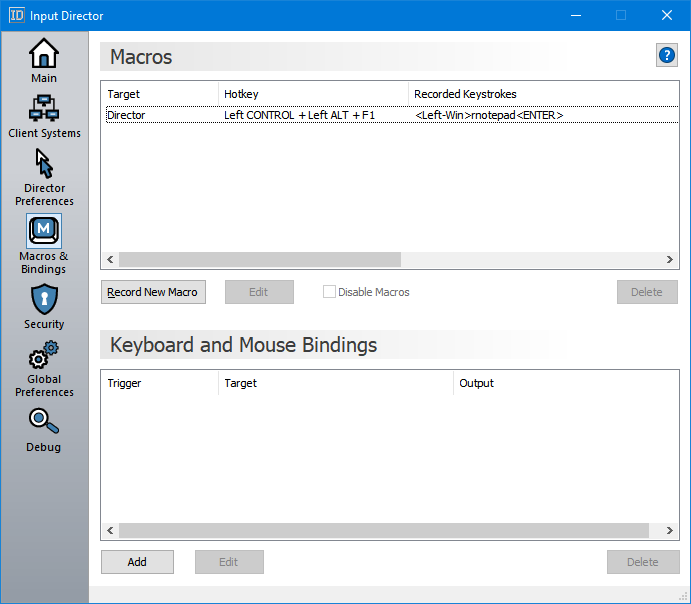 Input Director is a Windows application that enables controlling multiple Windows systems with the keyboard/mouse attached to one of the computers. A. 1.1 Why would I want to use Input Director? It isn't unusual these days to have multiple Windows desktops. Input Director is the solution to avoid having to switch between the keyboard's and mice attached to each computer. Switch control by moving the cursor to the screen edge on one computer and it will appear on the next one. Input Director also supports a shared clipboard - copy on one computer, switch control, and paste. A. 1.2 How is Input Director best used? Input Director is best used when two (or more) computers monitors are sat next to each other on a desk, with the master system's keyboard/mouse positioned below them. (This is a similar configuration to one computer with multiple monitors). A. 1.3 Who wrote Input Director? Input Director was written by Shane Richards. Please contact me . if you find any bugs, have suggestion for features or need commercial licensing information. A. 1.4 What is the latest version? A. 1.5 Where can I download Input Director? A. 1.6 How is Input Director licensed? Input Director is free for personal non-commercial use. Commercial licenses can be purchased for all other circumstances. For the latest commercial pricing and licensing information, please contact me. A. 2.0 What are the system requirements? A. 2.1 What is a master system? A. 2.2 What is a slave system? A slave system is a Windows computer that can receive its input (mouse and keyboard) from a master system. There is usually only one master system and at least one slave system. A. 2.3 Is Input Director compatible with multi-monitor setups? Yes. 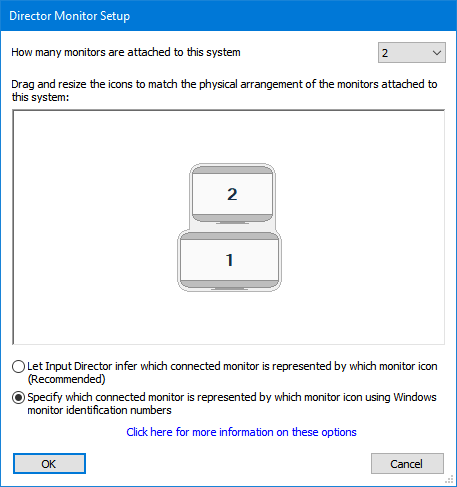 Instructions on how to specify the number of monitors attached to each system are located here. A. 2.4 Do I need to run the same version of Input Director on all systems? Yes. To use Input Director you must have the same version installed on all your computers. If Input Director detects an older (or newer) version running it will pop-up a warning message and you will not be able to control it. A. 2.5 How do I choose the installation directory for Input Director? By default, Input Director will be installed into C:\Program Files (x86)\Input Director. It is highly recommended that the default location is used. 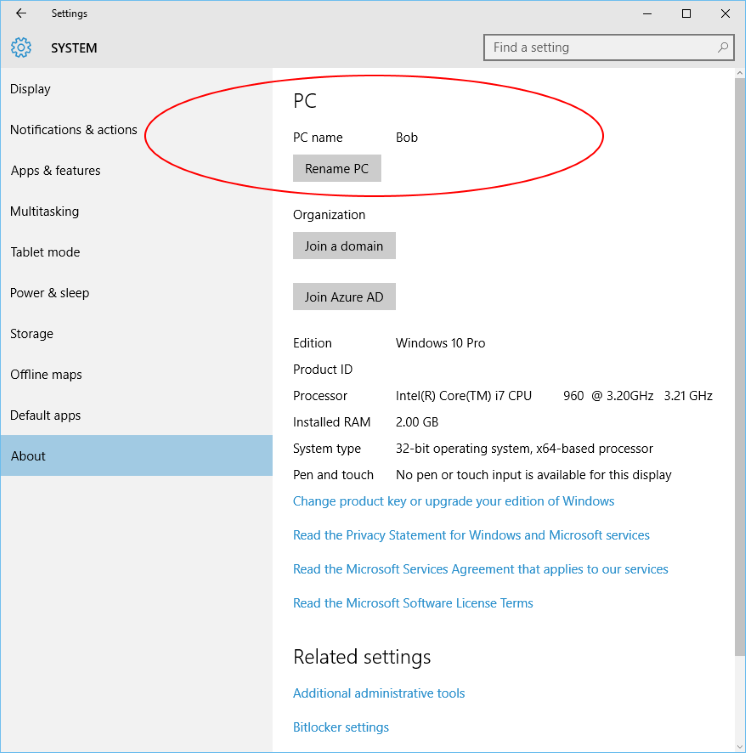 Particularly on Windows 8/10, Input Director must be installed in a Windows secure location, otherwise it cannot control the mouse/keyboard across high privilege processes. If you did want to use an alternate location, the Windows policy restriction will need to be changed (more information can be found here: User Account Control: Only elevate UIAccess applications that are installed in secure locations). If you did want to choose a different installation location, you need to run the Input Director Setup installer (e.g. from a command line) with the /D parameter set to your preferred directory. n.b. This must be the last parameter on the command line and must not contain quotes even if the path contains blank spaces. A. 2.6 Is there is a 'silent' install mode? Yes. Add the /S switch to the setup .exe file and Input Director will install or upgrade silently. n.b. If this is an upgrade there is a possibility the installer will need to reboot the system, in which case it will do so automatically. A. 2.7 Can one system be both a master and a slave? One system can have its Input Director configuration prepared to act as a master as well as a slave, and Input Director can be configured so that the systems automatically switch roles. A desktop cannot actively be in master mode and slave mode at the same time. A. 2.8 Does Input Director ever "phone home" (connect to a remote server)? No. Security is paramount, particularly for software like Input Director that transmits sensitive keyboard and mouse data between systems over the network. Input Director will only send keyboard and mouse data, and only to computers that are designated by you. In addition, Input Director supports encryption to ensure that information sent across the network cannot be eavesdropped. More information on encryption can be found here. A. 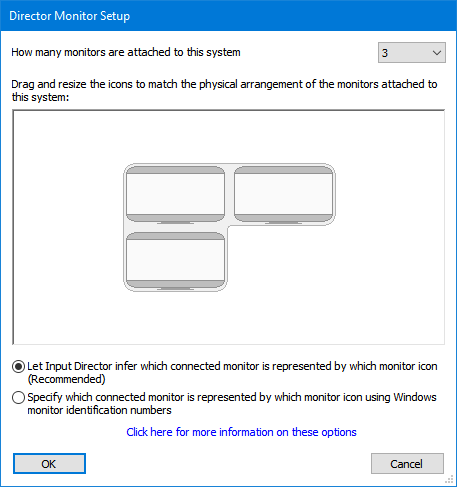 2.9 How do I specify how many monitors are attached to a system? On your master system, open Input Director and switch to the "Master Configuration" tab. To specify the monitors on your master system click the "Master Monitor Setup" button. To do the same for a slave, select the slave and click the "Edit" button. 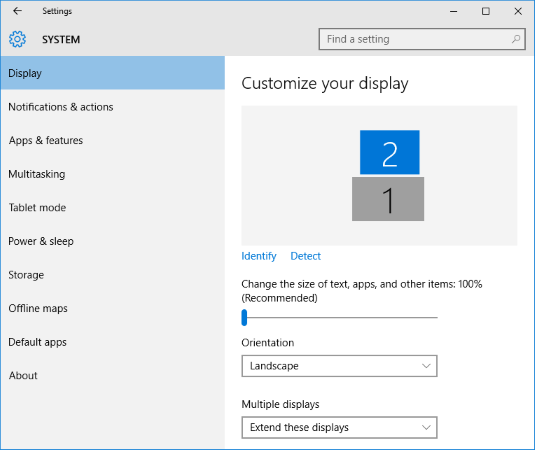 In both cases, you will be presented with a window from which you can select the number of monitors attached. Below this choice is a representation of the monitors. Drag the monitor icons so that they match the physical arrangement of the monitors attached to this computer: The example above demonstrates a master system that has 3 monitors attached with 2 monitors next to each other and the 3rd positioned below the top left monitor. A. 2.10 Is Input Director compatible with computer games? It really depends on the game. If the game requires you to use the mouse, then there may well be problems with the game when Input Director is running. Your best bet is to try the game in question and see what happens. You will probably have less trouble with games running on a slave system. Input Director updates the Capslock, Scroll Lock and Num Lock LEDs to reflect the status of the system being controlled. This feature may interfere with the controls of a game. To switch it off, on your master, open the "Master Preferences" tab and uncheck the "Master keyboard LEDs reflect the status of the directed slave" option. Click the "No screen-edge transitions" so that it is ticked and retry playing your game. You can also setup hotkeys to turn screen-edge transitions off and on. To do so, open Input Director on the Master system and switch to the 'Master Preferences' tab. The hotkeys can be set there. A. 2.11 Do I need to disconnect the keyboard/mouse from a slave system? No. Input Director can quite happily control a slave system with its keyboard/mouse attached. In fact, you will most likely want to leave the keyboard/mouse attached just in case you wish to use that computer and Input Director isn't running or your Master system isn't switched on. A. 2.12 What is the Information Window "Make input pass-thru this window" option? Enabling "Make input pass-thru this window" means that any clicks on the Input Director information window will pass through it to any window or the desktop below it, as if the Information Window isn't there. Once you have enabled this option you cannot resize, reposition, change the transparency of the Information Window, as you will not be able to right-click on it to bring up the context menu. To be able to change it again you must bring up the Global Preferences tab in Input Director and click the Information Window "Reset" button. A. 2.13 Is Input Director compatible with VPN Clients? It is common for VPN Clients, when they are active, to block network traffic to local networks. This is usually a security policy setting and is done to stop data "leaking" between the VPN and the local area network. If this policy is in place, Input Director won't be able to operate. Have a chat with the people running the secure network your VPN is connecting to (IT Dept?) and see if they can help change the appropriate settings for you. A. 2.14 Does Input Director support IPv6? A. 2.15 My anti-virus product has flagged Input Director as a virus / trojan / keylogger? Every so often an update to an anti-virus program will suddenly see Input Director as a virus/spyware/trojan. These false positives occur because Input Director has to hook into the mouse and keyboard data streams to achieve its function and this behaviour is similar to a "keylogger" program. Usually the anti-virus vendor will fix this in a future update to their virus dictionary. Re-download Input Director from its official site and re-install it (you can safely reinstall Input Director without losing your configuration). On the Master, open the "Master Configuration" tab on Input Director, and click the "Scan Slaves" button. If the slave(s) are marked with a red cross then the Master has been unable to communicate with them or the slave has been unable to respond. If you have a 3rd-party firewall running on your Master and/or Slave system have a look at this question. Are screen-edge transitions disabled? Right-click on the Master's Red "ID" icon on the notification status bar to bring up the context menu and confirm there isn't a tick next to "No screen-edge transitions". Nb: Disabling screen-edge transitions won't inhibit transitions via hotkeys between slaves and the master. On the master, has the slave you're trying to reach been marked as one to skip? Open the Master Configuration panel on the Master system and verify there isn't a tick in the "Skip" checkbox next to that slave. The master has been configured so that a key (or keys) must be depressed to permit a screen-edge transition to occur. Open the Master Preferences panel on the Master System and check if the "Held Keys for a Screen-edge transition" property has been set. If so, these keys will need to be held down whilst moving the mouse off the screen to transition to another system. If there are multiple monitors on either the master or any slave, Input Director needs to know how many monitors and their orientation, otherwise transitions between systems may not function correctly. Have a look at this question for more information. Have you turned on 'Use cached slave IP addresses' on the Master Preferences? This option can improve the transition speed between systems, but if one of your slave's can have its ip address changing frequently throughout the day (e.g. its wireless and its connecting/disconnecting and being allocated a different IP address everytime) then this option should be turned off. To control a slave before logging into it or logged in as a user not running the Input Director application, requires that Input Director has been set to automatically run on startup and be enabled as a slave. The usage guide provides more information on setting startup options. If you have set the startup options and it isn't working, the problem is most likely a firewall. During background slave mode a special Input Director application is running called the "InputDirectorSessionHelper.exe". If a firewall is blocking network access to it then the slave cannot be controlled. Some firewalls may not prompt you about the background application. Have a look at this question on setting up your 3rd-party firewall and check that the firewall is allowing both InputDirector.exe, InputDirectorClipboardHelper.exe and InputDirectorSessionHelper.exe access to the network. A. 3.4 Why does the cursor return to the master with 'slave unresponsive' messages? If the slave system is unresponsive for several seconds (usually due to a rogue application) or freezes. If you're running Windows 10/8/7/Vista or newer on your systems, you need to use the Ctrl-Win-L hotkey to lock a slave, rather than Win-L. This hotkey can be changed under the Master Preferences tab. On the Master, open Input Director, switch to the 'Master Preferences' tab, scroll to the bottom, and turn on the 'Use cached slave IP address'. On the Master, open Input Director, switch to the 'Master Preferences' tab, scroll to the bottom, and try turning off/on the 'Use reliable communications'. Try turning off the Cursor 'Water Ripple' effect option (located at the bottom of the Global Preference panel) on that slave system. The visual transition effect can slow down the cursor, especially if its running on older hardware or many programs are running concurrently. A. 3.7 The cursor isn't jumping to the correct system/monitor? If you have multiple monitors attached to either your master or any of your slaves you need to tell Input Director about them. Instructions explaining how to do so can be found here. A. 3.8 Why is the cursor still moving on the master even though I'm controlling a slave? A rare subset of software (usually games) running on the Master will hook into and monitor the position of the mouse using the same mechanism as Input Director. In these cases, Input Director is unable to supress the input from being sent to these applications. A. 3.9 Master Configuration issue - When I add a slave, Input Director informs me that the slave is this system and I need to add a different computer? First thing to check - are you trying to add your master as slave under Input Director on your master? If you're not sure about how to set up Input Director have a look at the Quickstart Install Guide. If you are definitely adding a different system as a slave and Input Director is misrecognising that system as being the same one as your master, it is possible that the master and the slave share a common IP address (e.g. they both appear to have the same public Internet IP address). To fix this, open the "Global Preferences" tab and change the Preferred Network Interface to the Local Area Network (LAN). Input Director will then ignore other network ip addresses. You need to do this on all your Input Director computers. If you're using a laptop as your Master, and your keyboard overlays the numeric keypad across other common keys, you may find that your numeric keypad suddenly becomes active when transitioning to a slave. Input Director updates the Num Lock LED to reflect the status of the system being controlled, which can activate an overlaid numeric keypad on a laptop. To switch this feature off, on your master, open the "Master Preferences" tab and uncheck the "Master keyboard LEDs reflect the status of the directed slave" option. A. 3.11 I can't resize/reposition/right-click on the Information Window? Most likely the input pass-thru option has been enabled on the Information Window. Have a look at the following answer. A. 3.12 My hotkey isn't working? Ensure that you do not use a key that is part of a key binding, in a hotkey. A bound key will always take precedence and as such the hotkey will never be triggered. Enforcing the master's keyboard layout on console windows running on a slave can be problematic. If this is an issue, you may need to setup hotkeys within Windows on the slave so that you can fast switch to the keyboard layout of the master. A virtual machine (running in VMWare, Microsoft PC, etc) on your slave will use the keyboard layout configured in the guest O/S. If you're virtual machine is running Windows, one workaround is to install Input Director in the guest system and configure it to be a slave. Then use input director to transition across to it and the Master's keyboard layout should be active. In rare circumstances, an application running on the slave may not recognise the change in keyboard layout. This can sometimes be rectified by returning the cursor to the master and then back across to the slave. A. 3.14 Input Director keeps informing me there are older/newer versions of Input Director trying to connect? If all your computers are running the same version of Input Director it is still possible to receive these warnings if your systems are connected to a larger LAN with many connected computers, and one or more of those other computers are running different versions of Input Director. You can tell Input Director to ignore these other systems by switching to the "Global Preferences" tab, clicking the "Suppress Warning Messages" button down the bottom and checking the option "Hide warnings about receiving messages from older versions of Input Director". A. 4.0 How can I control a slave before I have logged into it? On the slave system, start the Input Director application and switch to the "Global Preferences" tab. You need to make sure that Input Director is set to be run on Startup and that "Input Director enabled as a slave" is selected. The usage guide covers startup options in more detail. 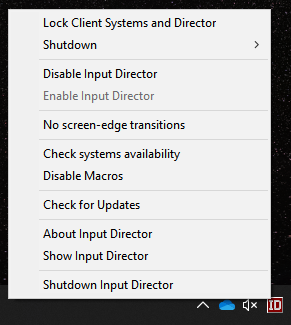 Input Director has a special background slave mode that will let you control a slave system when the Input Director application isn't running. This will work for any user logged into the system and prior to logon. The background slave does not provide the ability to use the remote clipboard or play a macro. You need the Input Director application running for this functionality to be available. A. 4.1 How do I return the cursor to the Master system? When using Input Director and controlling a slave system, it is possible that a program on the slave could cause it to freeze, crash or reboot and you find yourself without your cursor. To return the cursor to the Master system you need to use the Master hotkey. The default is ctrl-alt-break. If you ever get stuck on a system, use this hotkey to return control to the Master. You can also use a slave hotkey to switch to a different slave. A. 4.2 How can I quickly clear the 'skip' status of a slave? If you power on your Master before your slave system, the master can attempt to communicate with the slave before the slave has finished booting and finding its not available, mark it as one to 'skip'. You can click the 'Scan slaves' button on the Master Configuration panel on your Master and this will re-check all your slaves. You can also manually change the skip flag against a slave in the slave list in the bottom half of the Master Configuration panel. A shortcut to clearing the skip flag is to setup a hotkey for the slave. When you use a hotkey, Input Director will attempt to switch across to the slave regardless of whether its been set to skip or not. If it successfully transitions then the slave is marked as 'unskipped' and you don't have to go and 'scan slaves'. So if you want to check if a slave is up and running, try the slave hotkey and either you'll get bumped back to the Master because Windows hasn't finished starting up, or successfully transition and then you can use the mouse to go backwards and forwards. More information on slave skipping can be found here. A. 4.3 How do I determine a computer's (host) name under Windows? 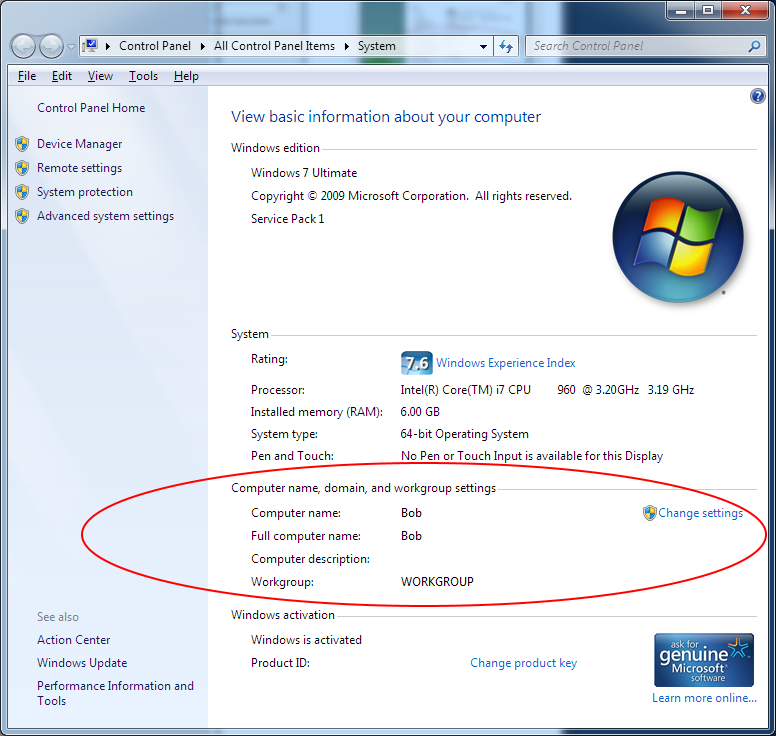 In the example shown, the computer's name is "bob". Some system may have a fully qualified name (e.g. "bob.computers.com"). When entering a hostname you can usually just enter the shortened name (e.g. "bob") if all the computers you'll be using are part of the same domain or workgroup. If this doesn't work then enter the full name (e.g. "bobs.computers.com"). Input Director also supports entering IP addresses whereever it needs a hostname. Only do this if you know that the IP addresses assigned to your computers are static and will not change over time. In the lower half of the window will be the "Computer name, domain and workgroup settings". In this example, the computer's name is Bob. A. 4.4 How do I setup my 3rd-party software firewall to allow Input Director Masters and Slaves communicate? Input Director communicates using both UDP and TCP on port 31234. There are two applications (.exe files) that need to be allowed to communicate both inbound and outbound: InputDirector.exe and InputDirectorSessionHelper.exe. They are located in the install directory (this defaults to "C:\Program Files\Input Director" or on a 64bit Operating System to "C:\Program Files (x86)\Input Director" ). If you are running the Windows firewall, the Input Director installer will automatically add the necessary rules to enable it communicate. Good 3rd Party firewall products will prompt you the first time that one of these .exe files attempts to communicate and let you decide whether to allow them to do so. A. 4.5 How do I secure Input Director? Most firewalls built into routers/modems these days by default will not permit external systems to directly communicate to computers on your local area network unless you've explicitly allowed them to. If you are unsure how to check that your firewall has been configured properly, ask a knowledgeable friend can help you. A. 4.6 How do I set up Input Director so that I can use any keyboard/mouse to control any system? Input Director has an auto-switching feature that will automatically switch a system's role between master and slave. To use auto-switching every system has to have both its master and slave configuration set. The usage guide covers the steps to set up auto-switching. A. 4.7 How do I get rid of the "Water Ripple" effect? Open Input Director on the system in question and switch to the "Global Preferences" tab. Uncheck the Cursor "Water Ripple" effect option found at the bottom of the panel. A. 4.8 How do I stop my cursor from accidently slipping to another system? If its just one system you need to temporarily stop the cursor moving away from - you can turn screen-edge transitions off on that system by right-clicking the "ID" icon and selecting "No screen-edge transitions". This option is particularly useful if you are about to run a mouse-driven game on your system. You can setup a key or keys that must be depressed to allow the cursor to move from one system to another. To setup a held key, open up Input Director on the master and switch to the "Master Preferences" tab. Click the "Change" button next to "Held keys for a screen-edge transition" and choose your key (or keys). The Left-Shift key is a popular choice for this setting. You can change the transition options (found under Master Preferences) so that the cursor must be double-tapped or it must linger next to the screen-edge for the cursor to transition across to another system. These options can complement the held key(s) option above. If you find that transitions near screen corners are a bother, you can switch them off from the "Master Preferences" tab, transition options panel. Documentation about these transition options can be found in the Quickstart Usage Guide. A. 4.9 How do I turn on Mirror Input Mode? Mirror input mode allows you to broadcast your mouse gestures and keyboard input across all computers, master and slaves. Click the "Mirror Input across Master and Slaves" button. A confirmation dialog box will pop-up. 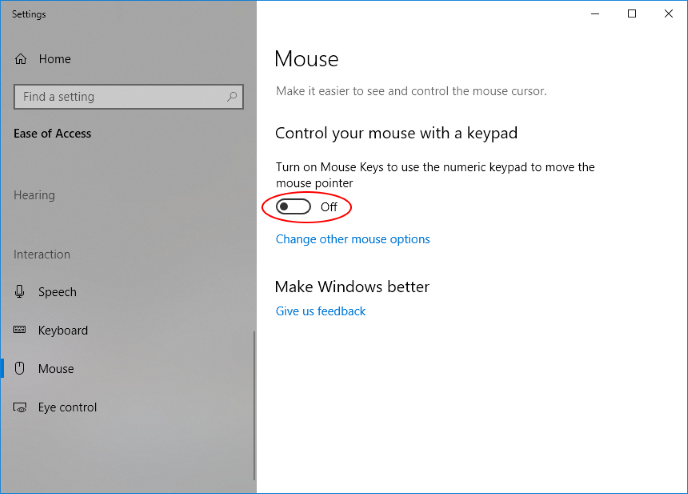 To turn off mirror input mode, either click the "ID" icon on the Windows notification status bar, use your Master system hotkey or your Mirror hotkey. Some of Input Director's common notifications and behaviours can be suppressed. Open the "Global Preferences" tab and click the "Suppress Warning Messages" button (in the bottom right corner) to view the filter options. A. 5.0 When I add a slave, I get a "Hostname doesn't exist error"
When you attempt to add a slave, Input Director will check if the hostname you have entered exists. You need to re-check the name of the slave you are trying to add. Have a look at determining a computer's name to ensure you have entered it correctly. You may need to enter the complete name of the host (e.g. if your computer is othercomp.personalnetwork.org.au, make sure enter the complete name, not just 'othercomp'). A. 5.1 What does a green tick next to a slave's name mean? A. 5.2 Why am I getting a red cross next to a slave's name? Input Director isn't enabled as a slave on the slave system (ensure that the "ID" on the Window notification status bar is green on the slave system). The slave's listening port (found on the preferences panel) doesn't match the slave configuration on the master. A. 5.3 What is slave skipping? Skipping can be used to "skip" over a slave when using the mouse to move the cursor from one system to the next. This is handy for dual-boot systems or when using Input Director and one of the slaves is switched off. Input Director doesn't permanently store whether a slave should be skipped and the flag will be reset if Input Director is restarted or the Master system rebooted. Clicking the "Scan Slaves" button will cause Input Director to reset all the skip flags and then set to skip those slaves that don't respond. If transitioning to a slave fails, Input Director will pop up a dialog box and offer to mark that slave as one to skip in future. Is manually set by checking its skip checkbox. A skipped slave has been switched to by using its hotkey. This is a handy shortcut as it means that if you have just switched a slave's machine on and you want to clear its skip flag, all you need do is hotkey across to it. It is manually changed by unchecking its skip checkbox. On the "Master Configuration" tab, you can set Input Director on the Master so on startup all slaves default to being skipped. Then the master will query and clear the skip flags for all available slaves and as they become available. A. 6.0 How should I decide how to limit which master systems can control a slave system? Allow any computer to take control - This option should only be used if your systems are on a secured network (not connected to the internet) and you trust each person who has access to your networked computers. You might choose this option if you have an isolated network of 2 or 3 computers that are all under your control. Allow computers on a chosen network subnet to take control. This is an advanced option and might be used by those comfortable in how their network is configured and know which subnet will limit access to computers that they control and trust. Allow computers from a set list to take control - This is the recommended way of limiting which systems can act as a master, as it allows you to list precisely which computers may take control. A. 6.1 When I add a master system, I get a "Hostname doesn't exist error"
When you attempt to add a master, Input Director will check if the hostname you have entered exists. You need to re-check the name of the slave you are trying to add. Have a look at determining a computer's name to ensure you have entered it correctly. You may need to enter the complete name of the host (e.g. if your computer is master.personalnetwork.org.au, make sure enter the complete name, not just 'master'). A. 7.0 What type of data can be copy/pasted using the shared clipboard? Input Director recognises most common data formats that are copied to the clipboard including text, csv, and bitmaps (jpeg, gif, etc). When an application, such as Microsoft Word, copies data to the clipboard, it will put onto the clipboard the range data formats that it can supply that data as. So, if you copy a section of a word document onto the clipboard, Word will register that this data is available as text, as rich text format, as well as several internal formats. Input Director will offer to other authorised Input Director systems those formats it supports. Most of the time, this is fairly seamless, but there are times when the information pasted ends up in a different format. For example, if the word document had a Visio object embedded in it, then the pasted version may have the visio object as a bitmap. A. 7.1 Why do I see an "Unable to paste" message pop-up when I am not pasting? Windows and running applications sometimes check the clipboard in the background without you prompting them. If the data isn't available for some reason then you may see this message even if you didn't explicitly try to paste. If you copy a particularly large amount of information it can take the source application some time to prepare that information before it can be sent across to the machine thats doing the pasting. In particular, Microsoft Word can defer supplying information to the clipboard until such time as an application begins a paste. If Word needs to transform the information into a different format first, then that can take some time. A. 7.4 How do I do file copy/pastes? Input Director's file copy/paste function is intended to act as a shortcut to copying files between different computers. It uses Windows network shares to copy files between systems. This approach takes advantage of the optimised network file copying built into Windows. It also ensures that Windows security is not overridden via the use of a proprietary network back channel. To copy files, they must be available on a network shared directory on the source system and that the user (you) logged into the machine doing the pasting has at least read-level access to that shared directory and file. The rule of thumb is the you must be able to use Windows Explorer to navigate to the network share on the other computer and manually copy the files. If you try to copy files that aren't accessible via a network share, Input Director will warn you as such when you attempt the paste. Likewise, if some of the files are network accessible and others are not, Input Director will copy over the accessible files and warn you that not all files were able to be copied. A. 7.5 What is the purpose of the exclude C$, D$ shares option on the preferences page? When you select a file(s) to copy, Input Director looks to see whether that file is available via a network share. Many Windows systems are setup with default shared directories called C$ and D$ that represent the root directory on C: and D: respectively. The default security setting for these shares limit their access to administrators only. By leaving this option on, Input Director will ignore these default shares when determining if a file on the clipboard is network accessible. A. 8.0 How do I switch on encryption? The usage guide covers how to configure encryption. Please read the instructions carefully, particularly if you don't have a keyboard/mouse plugged into your slave system. A. 8.1 What information is encrypted? When data encryption security is active on a slave system then all input data (keyboard and mouse) and all clipboard data is encrypted across the network to and from it. If remote clipboard data is copy/pasted from one slave to another and they both have data security active then the clipboard data will be encrypted, but if you have a mixture of secured and unsecured slaves then copying information from a secure slave to an unsecure slave will not be encrypted. A. 8.2 Which cipher does Input Director use? Input Director uses the Advanced Encryption System (AES) cipher. A. 8.3 Which encryption library does Input Director use? A. 8.4 Why is the message "The system xxxx does not have data security and is retrieving remote clipboard data insecurely" being displayed on a slave when I paste clipboard data? This message is alerting you that clipboard data is being copied from a secured slave to an slave without data encryption security active and thus the information being transferred is not encrypted. Input Director will still allow the copy to occur. To avoid this occuring, all slaves need to have data security activated. A. 9.0 What is the intent of Input Director macros? Input Director has a keyboard macro facility, which allows the recording of keystrokes into a macro and then the playing of that macro back, triggered by a hotkey. It is not designed to be a fully-featured Windows Macro Automation solution. It provides flexibility in where those keystrokes are played back - e.g to the system with current input, only to the master system or a particular slave system, etc. A. 9.1 How do I record a macro? To begin recording a keyboard macro, click the "Record New Macro" button. Every key hit will now be recorded (approximately 250 keystrokes can be recorded in a single macro. 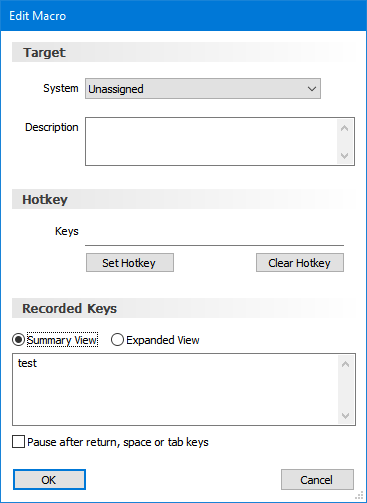 Your keystrokes will still be recorded even if you switch to another slave (though if you use a hotkey to switch to a slave, the hotkey itself will not be recorded). Your keystrokes will be displayed in the "Recorded Keys" section. To enable this macro you must change the Target from "Unassigned" to something else from the list (an "Unassigned" macro is disabled). Finally, a hotkey needs to be assigned to the macro (this is the mechanism used to trigger the macro). To set a hotkey, click the "Set Hotkey" button and hold down the key combination you'd like to use. You can set Input Director to include a short pause after each return, tab or space key. This may improve playback, if it is playing too quickly for some applications. A. 9.2 What are the different Macro targets? Unassigned - The macro is disabled and has no target. System with Input Focus - Whichever system has the (mouse/keyboard) input will be the one that the macro is played to. Master - No matter which system has the input, the macro will be played on the Master system. Slave with Input Focus - If the system being controlled is a slave system then the macro will be played on it. If the master system has the input then the macro isn't played. Slave: slavename - The macro is bound to a particular slave. No matter which system has the input, the macro is played to that specific slave. A. 9.3 How do I play a Macro? To play a macro, use the hotkey you've assigned to it to activate it. Macros will not be played if you've disabled Macros (via the checkbox on the Macros tab or the "ID" icon right-click context menu. A. 9.4 Can I record mouse movements/clicks? No, Input Director's Macro system only supports recording keystrokes. A. 9.5 I clicked the "Stop Recording" button and the Edit Macro window didn't pop up? The Edit Macro window will only pop up if you have recorded one or more keystrokes. A. 9.6 I tried to record a macro but none/not all of my keystrokes were captured? To record keystrokes you must be recording from the Master system and Input Director must be enabled. If you clicked the "Record New Macro" button on the master system (using the keyboard/mouse attached to it) and then switched to typing on the keyboard attached to your slave computer, Input Director will not be able to capture your keystrokes. If you wish to record the keystrokes on a slave system you can do so by starting macro recording and then transitioning across to that slave and typing (as you would do as part of the normal use of Input Director). Make sure Macros aren't disabled on the Master. To check, open Input Director (on the master system) and switch to the "Macros" tab. Make sure the checkbox "Disable Macros" isn't set. Check the target on the macro in question - open Input Director (on the master system) and switch to the "Macros" tab. Double click on the problem macro to open the "Edit Macro" window. Ensure that the target isn't unassigned and that it's set appropriately. Without realising it, the mouse was used partway through the recording to change the state of an application or which field had focus. Input Director only stores keys, so if you needed to use the mouse the macro won't run the same way when its played back. The macro is dependent upon something transitory. For example, if you had recorded the macro and a particular application was open, or you were running some tool that through your keystrokes you accessed and that application/tool isn't running (or is running in a different mode) then your macro may not playback correctly. The macro was recorded on one system and played back on another. It may be that the system you are playing the macro back on has differences to the one you recorded it on. Input Director will record keystrokes from slave systems as well as the master system, so you're best recording a macro on the system you intend to play it back on. If you are recording a macro that you wish to play on multiple machines, it is best to keep it as short and as simple as possible. Input Director's macro system is not designed to be a fully-fledged Macro Automation solution. There are many of these available (and can be found easily with your favourite search engine). If you are looking for a richer set of capabilities you are best exploring those alternatives. It may be feasible to script/record a macro in another macro system and then setup an Input Director macro to trigger it. This is advantageous if you want to activate a macro on one of your computers as Input Director's macros can be bound to a specific master/slave system.